Alex Langlands is a patron of the Heritage Crafts Association and presenter of the successful BBC programs Victorian Farm and Edwardian Farm. He is also one of the main speakers at the V&A crafts conference organised by HCA, see the full line up here. Alex has always had a passion for craft skills and spends much of his free time with his brother, Tom, engaging in traditional crafts. From bee-keeping to boot making, gardening to hedging, walling to cider and beer-making, both brothers have a good understanding of raw materials. 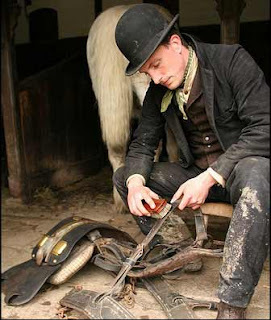 For Alex's series THE VICTORIAN FARM, Tom researched and hand made Late-19th Century hob-nail boots (below). "Traditional crafts represent an important part of both our rural and urban heritage and a familiarity with the raw materials around us and their uses helps us today to live sustainable, low-impact lifestyles. We must endeavour not only to conserve these skills but also to find relevance for them in the modern day." "The recepticals and tools we use, the buildings we occupy and the food we eat were once made from raw materials and produce sourced from within a day's walk of their point of consumption. This developed understanding of the environment is a skill that today most of us are lacking. Despite the fact that a return to such a lifestyle would be impossible, it remains for us to explore ways in which we can learn from the past for a greener future." "Crafts should be about pleasure and therapy as well. There are few that doubt the value and worth of a creative element to anyone's day and the ritual use of the hands and mind in the formation of both a functional and beautiful artefact can serve only to relax the mind and improve the body." 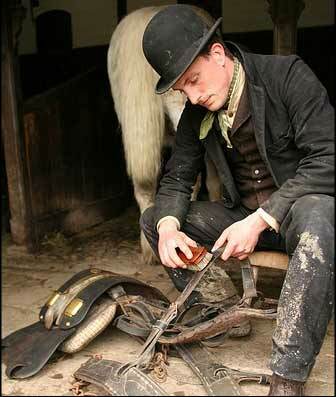 Alex will be talking about his experiences working with craftspeople, learning a range of traditional crafts and filming Edwardian farm, it will be a fun informal day and good to have traditional crafts shown in the most important museum for decorative arts in the world. Book now whilst you can get cheap train tickets. Yippee... a spinning wheel. I love the reconstruction programmes, and whilst textiles crafts are covered - with industrial weaving this week - would like to see more of the spinning and practical "arts & crafts" crafts which would have been around during these periods..